There was one contribution on TTIP calling on Labour and the PASD to oppose TTIP, firstly because of the threat ISDS poses to the NHS but also because of the threats to food standards. We should add that ISDS is a threat to all government regulation, and that the US negotiating position and the supine agreement of the retiring Commission remains a threat to food safety, environmental protection, employee protection and privacy standards in Europe. As pointed out by speakers at Labour Party conference, not only is the NHS potentially under threat, so is education and other public services. I say again, excluding the NHS from ISDS is not enough to make TTIP acceptable, although one speaker mentioned the US tax & tariff regime that protects the US energy market and the advantages that TTIP might make to the EU if these tax barriers were reduced. Everyone seems to find at least one fig leaf that allows them to support it. Another theme repeated was that of accountability of the MEPs and that a single all London constituency makes accountability difficult, one attendee suggested a move towards the German model adopted in both London and Scotland. (I think it’s coming.) Such a change would re-establish a constituency link between the MEPs and their voters and parties, with which I agree. It is an interesting point that British Political Parties still attempt to talk to voters by door step campaigning. There can be no doubt that having a constituency as large as London makes this hard. One of the reasons that Labour did well in the cities last May is that they were electing their local councils on the same day and the power of the doorstep campaign reflected that. It was pointed out that the number of MEPs per country is agreed in the treaties and that increasing the number for the UK would provoke considerable resistance. This led me to see how this works across Europe. The fabulous Wikipedia, has a page, that yields this chart. 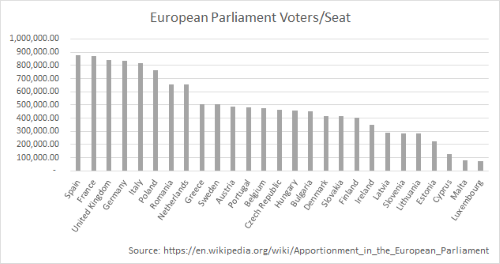 While talking to a friend they pointed out that if one was to reduce, say Luxembourg’s representation below six members, this would reduce the proportional nature of the results, and if one was to increase the UK representation to the same rate as that of Luxembourg, the UK would have of the order of 780 representatives, which is more than in the UK parliament today which some consider too large, although I don’t. It would also suggest a European Parliament of about 6,500 representatives. (This could probably be halved without destroying proportionality.) A member of a body of this size wouldn’t get a lot of speaking time; the CPSA annual conference in the 1980’s, not necessarily a beacon of representative democracy was about 3500 delegates and they still had block/card votes to ensure numeric equality because like in the European Union smaller branches representation meant they were over represented by their delegates . Perhaps that’s the answer, introduce card votes to the European Parliament. Funny how articles go, this wasn’t meant to be an article on electoral arithmetic, more an exploration on parties and accountability but hey, they go where they go. I made some small changes this morning. I clarified the UK MEP accountability issue and the nature of the German model, also known as the Additional Member System which was what was proposed for the UK by the Jenkins Commission in 1997. I put some more facts and a bit of context into the section on voter’s power including the comparison, in a hover comment, between Belgum & London.